Grid reference: 501650, 107300, View on: Google Maps, Open Street Map, Streetmap, National Library of Scotland Map or Oldmaps. There are 163 baptisms in the OPC database. IGI Batch: P017151 (1748 ~ 1835, 1849 ~ 1863). POWPics (The New Roughwood Church Album) contains 1 photographs of this church. 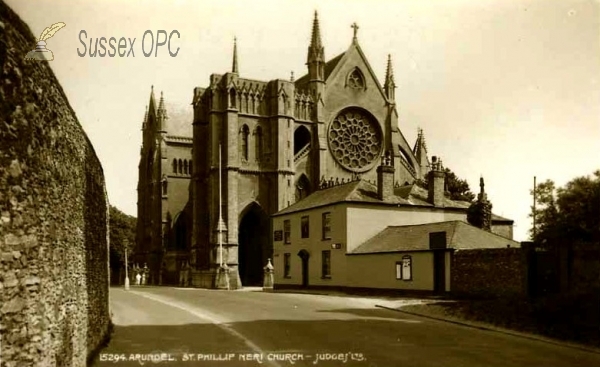 This album will also display any postcards or other images of the church which are in the Sussex OPC database. There are 33 images of this church in the OPC database. Style: French gothic. Bath stone. Stump of tower at north west, octagonal baptistry. There are 2 documents concerning this church in the OPC database.